There is a lot to learn about wedding bouquets. There are so many different types of flowers, it’s overwhelming! White bouquets are classic, but I find myself always drawn to the more colorful bouquets. 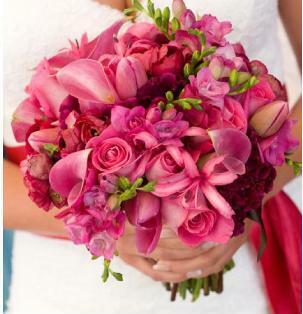 I love the look of a bouquet that has varying types of flowers all in shades of the same color. For our wedding, I think I’d like to carry a purple bouquet. I think it will go nicely with my ivory dress. 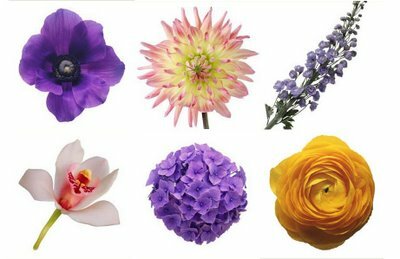 Although I am not a florist, I have looked at some options that I think I’d like to have in my bouquet. Of course I wouldn’t have to have all of them! Anemones, dahlias, delphinium, orchids, hydrangeas, and ranunculus. Of course, I would want them all in varying shades of a plum/purple color, if possible. Here are a couple examples of the flowers in the right colors. Orchids, ranunculus, hydrangeas (please ignore the stephanotis in the middle) and dahlias. I hope the bouquet would look something like this pink one, below, as far as size and shape. This is also where the idea of mixing flowers came from. I realize none of the flowers are the same. 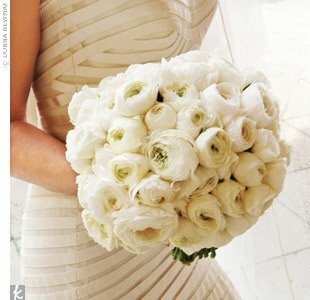 Although, I also love the idea of having a bouquet of just ranunculus. They are by far my favorite flower! Something like this bouquet in shades of purple, minus the peonies, and smaller (you’ll have to use your imagination!). What flowers do you think would look good in an all-purple bouquet?